A little less corn, a little more syrup. From its ugly orange posters to its silly, misleading theatrical trailers, everything about THE INFORMANT is an exercise in bad marketing. Supposedly based on a true story, Matt Damon is Mark Whitacre, a VP at the agricultural corporation Archer Daniels Midland in Decatur, IL, who agrees to turn informant for the FBI when ADM and its global competitors are accused of price-fixing. 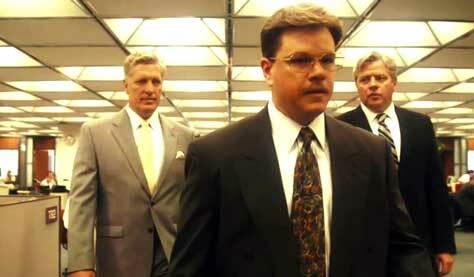 The Kurgan and Biff Tannen close in on Jason Bourne. What might have been an involving drama is turned into a faux madcap comedy that isn’t – except in the trailers, which overdub dialog snippets over wrong parts of the movie to make it appear like zingers are flying left and right. But this is serious business. In this financial climate, audiences would have embraced a sober tale of uncovering corporate greed; instead, director Steven Soderbergh (who worked with Damon on the OCEAN’S films), brings an inappropriately glib atmosphere to the proceedings through overacting, kooky soundtrack and attempts at black comedy. Soderbergh definitely has his finger on the pulse of big band bop music, inserting satirical Bond-like flourishes to herald the start of Whitacre’s informant career. But the sassy soundtrack keeps pedaling past the point of the movie taking a darker turn, involving Whitacre being discovered as a pathological liar and embezzler. In its early stages, THE INFORMANT highlights the difficulty the FBI must have with any person willing to turn informant: that is, if a person has the propensity to be a snitch, it means they’ve got a big mouth, and not even the FBI can stop them shooting off that mouth at inappropriate times to the wrong people, which Whitacre does frequently. But again, it’s not funny as the trailers make it out to be. It’s actually dangerously tense when he does this. Whitacre keeps up a constant voiceover that seems a meandering stream of consciousness, but hidden in the off-topic musings are clues to his enigmatic personality. Is it a true story? I don’t really care at this point. As if big agri-business has stopped price-fixing and doing other corrupt things now that they’ve been exposed by this indicting film. Oh my, they might have to only declare profits in the billions this year instead of the trillions. Starring: Matt Damon, Eddie Jemison, Tom Papa, Rick Overton, Melanie Lynskey, Thomas F. Wilson, Scott Bakula, Scott Adsit, Joel McHale, Ann Cusack, Clancy Brown.